You will be after this therapy! To start your feet will be soaked in an aromatic blend of cleansing oils and herbs then we will use Reflexology to rebalance your body, which will help to restore and invigorate energy to your mind and body. To finish your feet will be drenched in warm oil and wrapped in heated pads, allowing the healing properties of the oil to take effect. Enhancing your being, using an unique style of massage with dream stones and warm oil on shoulders, neck, face and scalp while lying on our heated floatation bed, this therapy will ease away tense thoughts and worries, bringing peace to you physical and mental being. With herbal infused warm oil poured onto the forehead and through the scalp this brings a deeper level of relaxation and taking you to the place of your dreams! 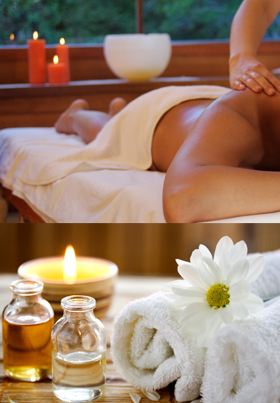 A divine therapy, starting with shoulders, neck, face and scalp being nurtured with hot towels, warm oil and deep massage techniques. Releasing and easing muscle pain. Then focusing on the feet with Reflexology therapy working reflex points which correspond to the rest of the body. Hot towels and Organic cream will be used to cleanse, rehydrate and nourish, finishing with your feet being wrapped in heated pads allowing you to drift away!